Kinder Morgan VP calls Burnaby MP Kennedy Stewart’s oil spill analysis of its Trans Mountain pipeline “stupid”, “ludicrous” and “astounding.” What do you think? Ducks dying, a Kalamazoo River blackened with oil, and haz-mat workers vacuuming sticky sediments in the worst land pipeline spill in U.S. history -- not the visuals Kinder Morgan wants to be associated with, especially when it had nothing to do with the disaster. "It's a stupid comparison," bristled Kinder Morgan vice president Hugh Harden from Calgary on Wednesday. 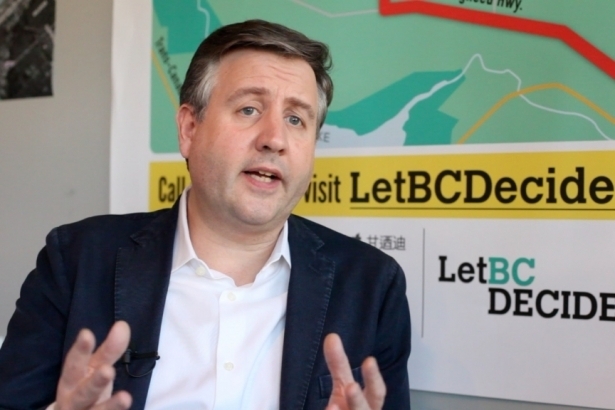 The oil executive in charge of Trans Mountain pipeline's operations was reacting to a new pipeline spill analysis from Burnaby Member of Parliament, Kennedy Stewart. The outspoken MP, well known for his opposition to Kinder Morgan’s $5-billion proposal to now expand the Edmonton-to-Burnaby pipeline, released new federal data on the existing pipeline's spills. The NEB records date back more than half a century, and show the total volume released by Trans Mountain was 40,000 barrels. The Kalamazoo disaster by Enbridge released 20,000 barrels. “Over the lifetime of this [Trans Mountain] pipeline, it’s leaked double the amount of the Kalamazoo spill,” said Stewart on Wednesday. 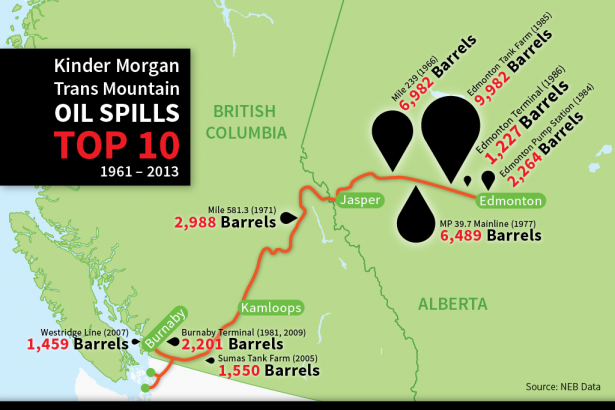 Stuart's office also issued a map graphic showing Trans Mountain's top 10 spills, with the largest three near Edmonton in 1985, 1977 and 1966. 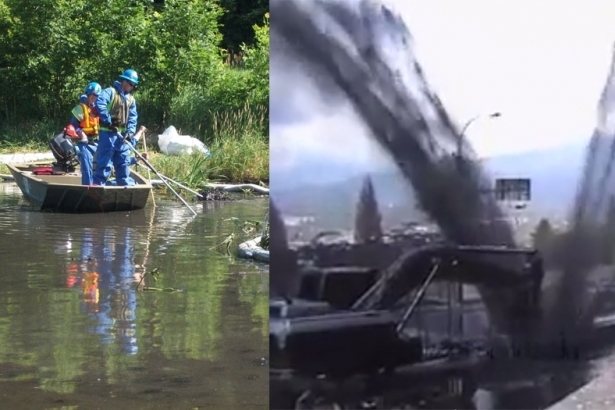 Oil spill clean-up workers on Kalamazoo River (2010, EPA); Oil pipeline burst in Burnaby in 2007 - courtesy Spirit Media. But Harden said the comparison to the disastrous Michigan oil spill disaster was "astounding." "Tell me how it is in any way fair, logical, or in any way reasonable to compare the operating record of a company over 60 years of 80 incidents, most of which are inside the terminal or company's property, and had no impact on the public or the environment, to one incident where 20,000 barrels of oil went into a river?,” asked Harden. "[The people in Kennedy Stewart's office] are totally one-sided, and unreasonable, and they are not looking at logic. They are looking at stirring up people's emotions and trying to get them to overlook the facts," added Harden. The oilman further likened Stewart’s analogy to a “jumbo jet crash with 340 people on board to a small company that flies planes with 8 people on it, and they had over a 60-operating-year history, they had 10 crashes." "I just had to laugh out loud when I read [the media request inquiring about it]." Harden later wrote: "I would like to apologize for comparisons I used which may have been interpreted as being inappropriate and once again I regret any offence that might have been taken." So is the planet worse off by a single mega oil spill versus dozens of smaller ones? “What really matters is the amount of area the oil seeps into, and the amount of time that it’s doing that, in those ecosystems. And that absolutely could be greater – in the event of a bunch of small spills, in part because the response can be slower in total, because it’s not employing a large scale response team,” said Chan. “There’s basically economies of scale for oil spills,” he added. Dr. Jeffrey Short, a science director at Oceana who spent 31 years as a research chemist focused on oil pollution with National Oceanic and Atmospheric Administration (NOAA), said it is difficult to make the comparison. “The question is, why did [Kinder Morgan] have [even] 10 spills? 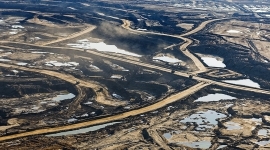 And if they're planning to triple the pipeline capacity, they're going to have larger spills," said Short, from Alaska.